For 2019, how is your professional development coming along? Or said differently, how is the “investment in you” going? One of the key takeaways I learned from a former supervisor (and still a current mentor) was this statement. He would say, “in your role in the field, we need you and your colleagues to be as well-equipped as possible. Your professional development, your expertise will either increase or limit your ability to give value to the PGA professionals you serve.” If you’re in a supervisory role, I would like to challenge you to invest more in those you lead in 2019. And, more in your own development. Joe is struggling to make his quarterly sales target, and is literally grasping at any connection he has, in hopes of “making his numbers.” In desperation, he starts to ask for help. In that ask, he is led to meet a mentor named Pindar to help him. He expects to have pay for the help, but surprisingly Pindar (aka The Chairman) gives him valuable advice at no cost to him. Instead, Pindar teaches Joe the “Five Laws of Stratospheric Success,” by having Joe meet various people who have already mastered these five laws. The book goes beyond the Law of Compensation, and further expands it into five laws known as “The Five Laws of Stratospheric Success.” In the book, the authors boldly recommend the reader actually try them, instead of just thinking about them. They believe, the reader will then determine for themselves that each of these five laws do indeed work. True worth: the true worth an individual brings is more than WHAT they do, or HOW they do it. The true worth might be a formula like this: (Your Why + Your Positivity + Your Effort + Your Professionalism) = Your True Worth (to those you give your time, effort and value to.) Another way to look at “true worth” is the difference one person makes vs a person who might replace them (eg. Similar to “Wins Against Replacement” or WAR score in baseball metrics.) Question: What is your true worth? Value: is a part of the customer’s “demand decision” (or the member’s, or the employee’s), and what they get from doing business with you, your facility, etc. is the way their value is defined. Question: Do you regularly enhance the value in your customer’s demand decision? Worthwhile payment: The old saying, “A good day’s pay for a good day’s work.” This is the accurate, but simplistic view. I would add that “a good day’s (or week, or year’s) effort is made more worthwhile, more fulfilling and more impactful when it the work is more beneficial to all involved. A “win-win” outcome to create “worthwhile fulfillment.” Question: Do you do more than a “good day’s work?” Do you create/drive “win-win” outcomes for your customer/member and/or your employer? “Now, by a network I don’t necessarily mean your customers or clients. I mean a network of people who know you, like you and trust you. They might never buy a thing from you, but they’ve always got you in the backs of their minds. They’re people who are personally invested in seeing you succeed, y’see? And of course, that’s because you’re the same way about them. They’re your army of personal walking ambassadors. When you’ve got your own army of personal walking ambassadors, you’ll have referrals coming your way faster than you can handle them. Employees first: as a leader/manager, if you put these, who often have the greatest contact with the customer first, they’ll put the customer (member) first and allow your influence to lead them, inspire them. Question: Do those you lead feel like they’re first, that you’re a servant leader? Community first: this one is the hardest to measure, but it can be the most powerful. The more you put the needs, outcomes and benefits for the community first, the more those who make up the community will allow your influence to guide, inspire and motivate their behaviors. Customer or Member first: if you build programming, experiences and event schedules around the “demand decision” of the customer, giving them preference (over your own), they’ll reward you, let you influence them and lead them to act in the ways of loyalty. Room to grow: receptiveness and willingness to learn is key to growth. When I was a general manager, I believe one of my “aha moments” was to try to “look for the constructive feedback, or the opportunity to improve that was within the complaint.” Once I started thinking this way, I found myself appreciating constructive feedback from customers, employees and peers; and I started to feel like there were less complaints I had to deal with. Now is the time to ask yourself some of these questions. 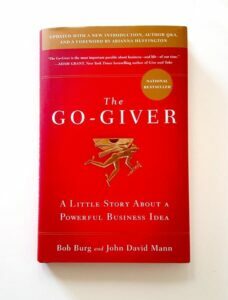 Are you a “Go-Getter?” Are you feeling like Joe did, burning out on the effort side of “getting?” Would you like to be a “Go-Giver” instead? Does that sound like a more fulfilling approach to reaching your goals, growing your impact and your income? If you’d like to get together with me to consider these questions, I’m in. When can we can make it happen? I appreciate the opportunity to help you (or those you lead) with your career and I hope you’ll give me the opportunity to partner with you on it soon.